Insects have three body sections, called head, thorax and abdomen. The head carries the eyes, the mouth parts and antennae. The thorax is made of three segments and carries three pairs of legs and generally either two pairs or only one pair of wings. The abdomen is made of a series of segments. What kind of pollinating insect is that? Different groups of insects vary on the shape of the head, thorax and abdomen. Of special importance are the variations on the kinds of wings. Future blog entries will cover four main types of flower visitors: 1. bees and wasps, 2. flies, 3. butterflies and moths and 4. beetles. 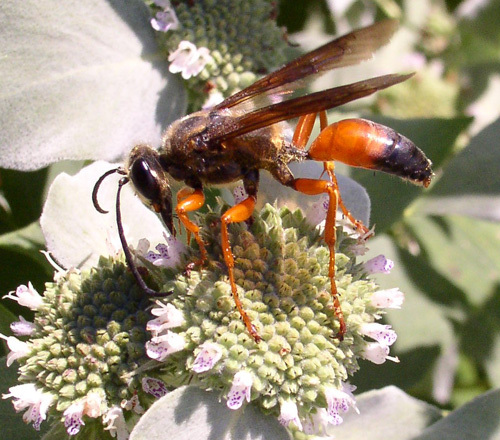 Bees and wasps have two pairs of membranous wings, they look like saran wrap. The main differences between bees and wasps are that wasps usually have a narrow waist (the separation between the thorax and abdomen) and are less hairy than bees. Female bees usually have a means to carry pollen, the so called pollen baskets or pollen combs, either on their back legs or on the underside of their abdomens. Sometimes these baskets are loaded with pollen. Ants are related to wasps and resemble them in their appearance, but they have no wings. Only queens and males have wings, but they are seldom seen. Ants are also frequent flower visitors. 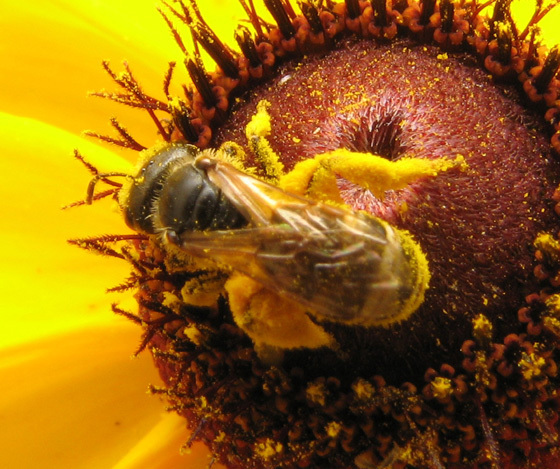 They rarely can pollinate flowers because they don’t fly and are not likely to carry pollen a significant distance. Flies are important pollinators too. Their wings are also membranous, like those of bees and wasps but they have only one pair instead of two. 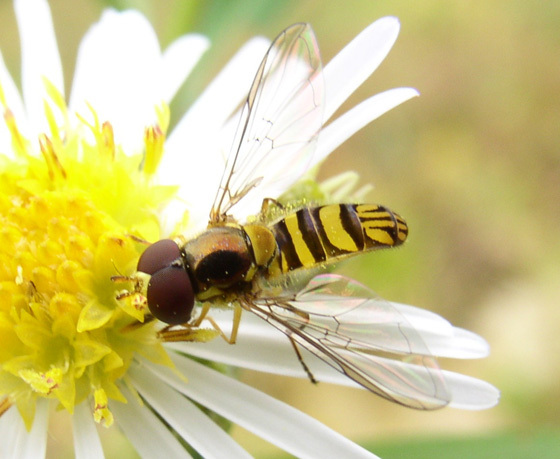 The flies that visit flowers often look like bees or wasps. They lack stingers so they are good mimics that try to fool hungry birds into thinking that they can sting. Some of the ways to tell them apart is by the eyes which are very large and by the short antennae, made of two separate parts. They are usually hairless and the legs are very thin when compared to those of bees. Butterflies and moths have wings covered by very tiny scales. If you touch them some of those scales come off and they look like dust. They have a very long tongue which they use as a drinking straw to sip nectar from flowers. When not in use they keep it rolled up under their chins. 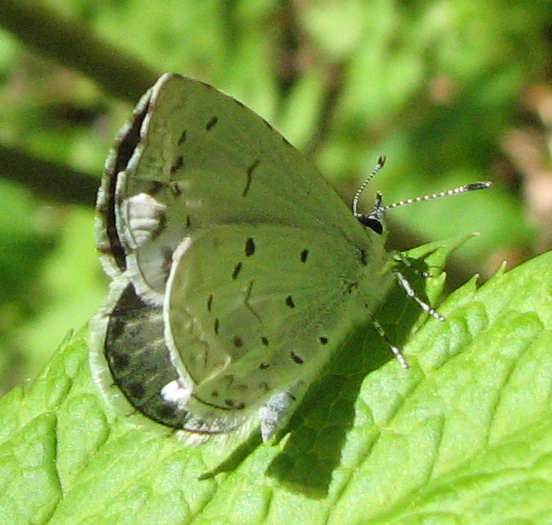 Butterfly’s antennae end in little knobs, while the antennae of moths can either be feathery or like a string, but never with a knob at the end. 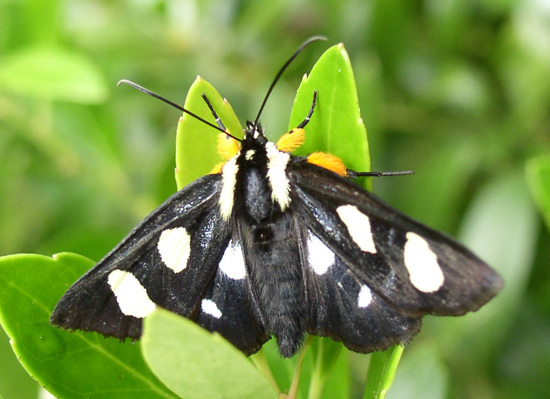 Butterflies usually fly during the day, while moths fly at night, although a number of them fly during the day. Night flying moths tend to be rather colorless, but those that fly during the day can be as brightly colored as many butterflies. 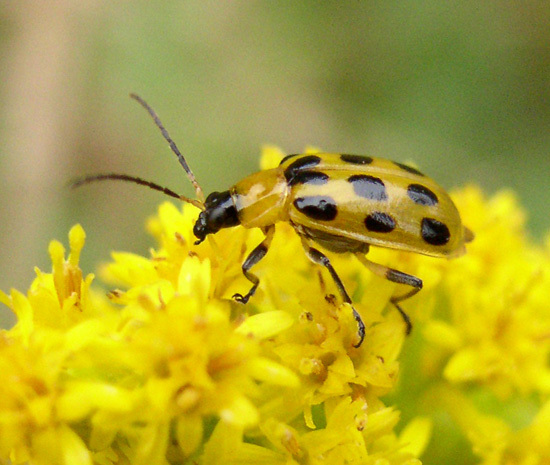 Beetles have two pairs of wings but the first set is modified and hardened into a wing case that covers and protects the second pair of wings. You only see this second pair when the beetle is flying or getting ready to fly. This second pair is also membranous like those of bees, wasps and flies and they remain folded under the first pair. 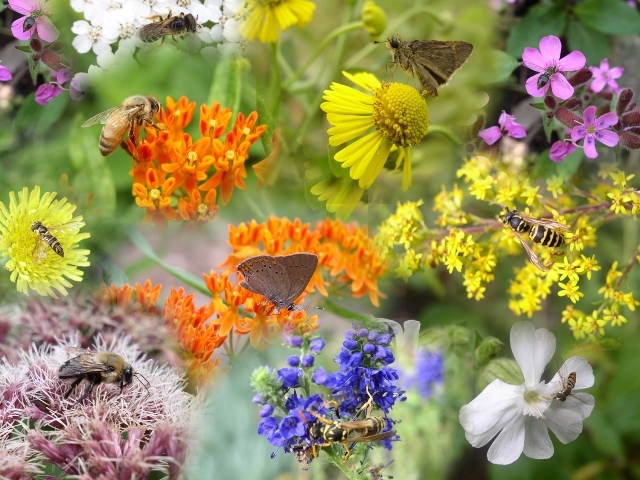 Where can you find pollinators? 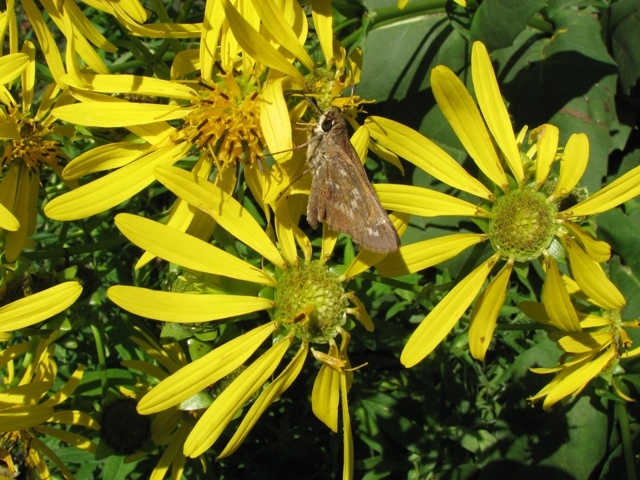 Look for pollinators at flowers. The best flowers are native ones. Garden flowers, especially the double ones don’t attract many pollinators, so tulips or fancy roses are not very good for pollinators. Most pollinators are active when it is warm enough, when it isn’t windy and when the sun is shining. There are a few that fly when it is dark and visit night blooming flowers. Some flowers attract many visitors. 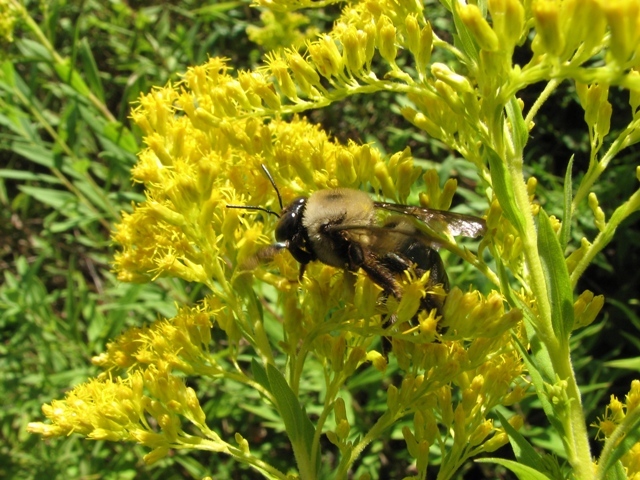 Two of the best ones are: common milkweed and all the goldenrods. 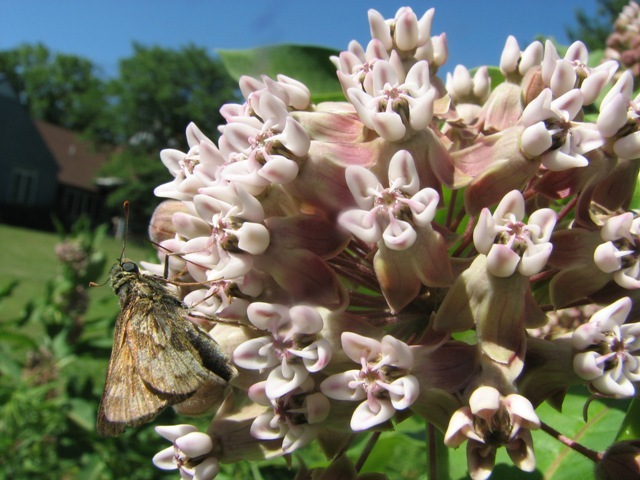 Common milkweed blooms in June and early July. The plants can grow 6 feet tall. They have large oval leaves and bunch of flowers arranged like a ball. The flowers are pink and emit a very strong sweet scent. Goldenrodsbloom in the fall, from September to November, depending on where you live. There are several types of goldenrods; they all have yellow flowers arranged in rods that give the name to the plant. Their scent is not particularly strong but many insects are attracted to it or to the colorful display. 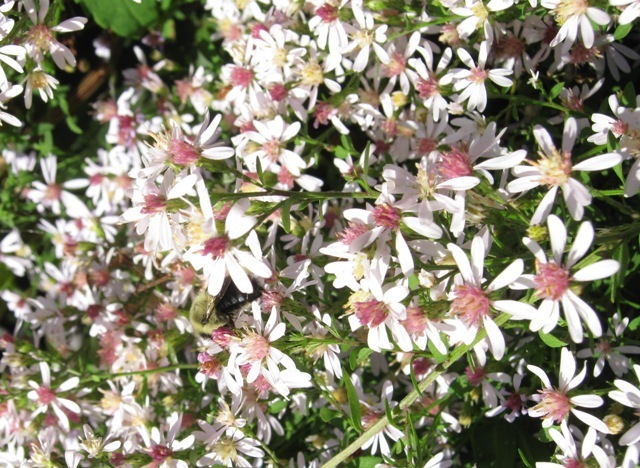 Asters and related flowers attract large numbers of pollinators. These include many daisy-like flowers such as sunflowers, black-eyed Susans, ragworts, cornflowers, as well as some plants which are not native, dandelions and thistles. 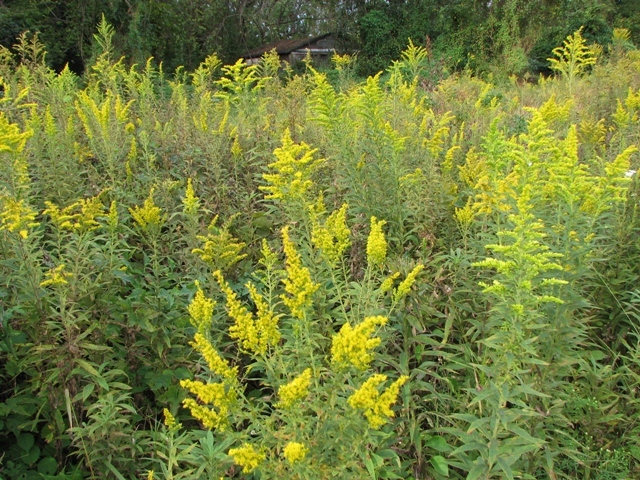 The above mentioned goldenrods belong to this family, too. Mountain mint and Queen Anne’s lace are also good attractants of a variety of flower visitors. This entry was posted on March 26, 2011 at 7:34 pm and is filed under conservation, flower visitor, pollinator. You can follow any responses to this entry through the RSS 2.0 feed. You can leave a response, or trackback from your own site. I believe it is a good learning tool. We will give you copyright credit. Thanks for your interest. Of course you can place a link on your butterfly page. Thank you very much.